Meet our proud new Pupil Council. They were delighted to have been voted in by their peers. Well deserved by all, I am looking forward to working with you! Let us see the St Enoch clock again! We are Bronze – Rights Committed! We are delighted to share our news – we are on our way to becoming a Right’s Respecting School and have received Bronze status. Our Children’s Rights Committee will be organising a showcase event to share our learning with you. More information to follow! @YOYP2018 #YOYP2018 #NLCChildrensRights #RRSA Please click the link below to view our Award. 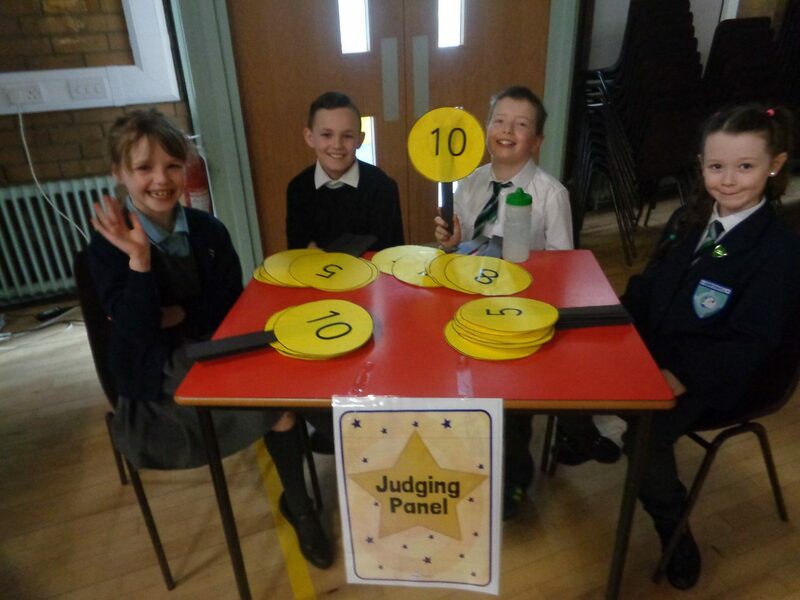 And to our judges who did brilliantly, they thought our acts were second to none. You were mature and fair in your feedback, excellent! Archer’s groovytastic moves and Sophie’s drumming took them to the top today when they won joint first. They each scored 40 points and you couldn’t get any better than that – their efforts paid off and their win was well deserved. Be really proud and enjoy the moment! Laylaa, Ava and Erin showcased their dancing and gymnastic skills. They flipped into the hearts of our judges as they achieved the next prize. Girls your performance today was simply superb! The great news is, we have our Pupil Council 2017/18. It was an exciting day for all of children who took the time to prepare a presentation for their class . I very much appreciate that you did, and I would have been delighted to work with each and everyone of you. You were all extremely worthy candidates, be proud that you put yourself forward and keep putting yourself forward for every opportunity that comes your way! We have our new Pupil Council! Here are the successful candidates. Well done to you all, I am very excited about working with you on a whole variety of different things that will complement our school… exciting things are ahead!